Don’t do imaging for uncomplicated headache. Imaging headache patients absent specific risk factors for structural disease is not likely to change management or improve outcome. Those patients with a significant likelihood of structural disease requiring immediate attention are detected by clinical screens that have been validated in many settings. Many studies and clinical practice guidelines concur. Also, incidental findings lead to additional medical procedures and expense that do not improve patient well-being. While deep vein thrombosis (DVT) and PE are relatively common clinically, they are rare in the absence of elevated blood d-Dimer levels and certain specific risk factors. Imaging, particularly computed tomography (CT) pulmonary angiography, is a rapid, accurate and widely available test, but has limited value in patients who are very unlikely, based on serum and clinical criteria, to have significant value. Imaging is helpful to confirm or exclude PE only for such patients, not for patients with low pre-test probability of PE. Performing routine admission or preoperative chest x-rays is not recommended for ambulatory patients without specific reasons suggested by the history and/or physical examination findings. Only 2 percent of such images lead to a change in management. Obtaining a chest radiograph is reasonable if acute cardiopulmonary disease is suspected or there is a history of chronic stable cardiopulmonary disease in a patient older than age 70 who has not had chest radiography within six months. Don’t recommend follow-up imaging for clinically inconsequential adnexal cysts. Simple cysts and hemorrhagic cysts in women of reproductive age are almost always physiologic. Small simple cysts in postmenopausal women are common, and clinically inconsequential. Ovarian cancer, while typically cystic, does not arise from these benign-appearing cysts. After a good quality ultrasound in women of reproductive age, don’t recommend follow-up for a classic corpus luteum or simple cyst <5 cm in greatest diameter. Use 1 cm as a threshold for simple cysts in postmenopausal women. Don’t recommend ultrasound for incidental thyroid nodules found on CT, MRI or non-thyroid-focused neck ultrasound in low-risk patients unless the nodule meets age-based size criteria or has suspicious features. (1) < 35 years of age with normal life expectancy and nodule ≥ 1 cm. (2) ≥ 35 years of age with normal life expectancy and nodule ≥ 1.5 cm. Two published studies reported that the percentage of nodules referred for ultrasound would be reduced by 35–46% using the proposed algorithm. Suspicious features on CT, MRI or US include signs of local invasion, and the presence of abnormal lymph nodes (enlarged nodes, nodes with cystic change, calcification, or increased enhancement). ii. Lymph nodes in levels IV and VI are especially suspicious for thyroid cancer metastases. * Clinical risk factors: Patients with history of head, neck or chest radiation, family history of thyroid cancer, or diseases that increase the risk of thyroid cancer should be further evaluated regardless of nodule size. Don’t use a protocol for abdominal CT that includes unenhanced CT followed by IV contrast-enhanced CT, except for the following indications: renal lesion characterization, hematuria work up, indeterminate adrenal nodule characterization, follow-up after endovascular stent repair, gastrointestinal hemorrhage or characterizing a focal liver mass. a. IV contrast phases are not necessary if nodule measures <10 Hounsfield units (HU) on unenhanced CT.
b. If ≥ 10 HU, unenhanced attenuation is used to calculate percentage washout. protocols that use only arterial and venous phase acquisitions may be sufficient, as hemorrhage changes configuration between the 2 phases. b. If available, dual energy can be used to create a virtual unenhanced dataset and avoid the unenhanced acquisition. Don’t routinely use a protocol for abdominal CT that includes a delayed post-contrast phase after the venous phase, except for the following indications: renal lesion characterization, hematuria work up, CT urogram, indeterminate adrenal nodule characterization, hepatocellular carcinoma and cholangiocarcinoma. With the goal of modulating patient radiation exposure, IV contrast enhanced multidetector CT (MDCT) protocols should include a delayed post contrast acquisition (defined as an acquisition after the portal venous, hepatic or nephrographic phases) only if it will provide additional diagnostic information. a. enhancement increases over time, justifying use of delayed in patients where distinction between cholangiocarcinoma and HCC is required. Don’t make the diagnosis of Pelvic Congestion Syndrome on CT or MRI unless the patients meet clinical and imaging criteria. Dilated pelvic veins can be an incidental, clinically insignificant finding on CT and MRI, or may reflect pelvic congestion syndrome. In the latter condition, dilated pelvic veins and venous reflux account for a range of symptoms, including chronic pain of more than 6-month duration. Radiologists must be cognizant of established criteria to suggest this diagnosis on CT and MRI. The diagnostic criteria include the following: 4 or more ipsilateral pelvic varicosities, 1 or more pelvic varicosities measuring more than 4 mm, ovarian (gonadal) vein dilatation > 8 mm in diameter. In patients with dilated pelvic veins that do not meet these criteria, interpretations should not suggest Pelvic Congestion Syndrome. Furthermore, since these criteria were proposed by Coakley et al in 1999, several investigations have confirmed that ovarian vein reflux, ovarian vein dilatation and parauterine vein dilatation can be observed in asymptomatic patients, particularly multiparous women. Interpretations should recommend that clinical symptoms guide decision-making with respect to the need for vascular interventional consultation. Don’t routinely recommend follow-up for nonobstructed, asymptomatic, isolated, short-segment jejunojejunal intussusception in adults. Transient, idiopathic jejunojejunal intussusception in adult patients can be identified on MDCT in the absence of gastrointestinal pathology. In patients without an identifiable lead point mass lesion, imaging characteristics that favor the transient variety include short length (≤ 3.5 cm) and absence of bowel dilation. Self-limited jejunojejunal intussusception can occur in the absence of any bowel disease, or the finding may indicate an infectious or inflammatory process, such as enteritis or Celiac disease. If CT reveals an asymptomatic short-segment, isolated jejunojejunal intussusception (no bowel wall thickening or mesenteric inflammation, no bowel obstruction, no lead point) follow-up imaging should not be routinely recommended. Decisions regarding the need for additional work-up and follow up imaging should be made on clinical grounds. The mission of the American College of Radiology (ACR) is to serve its 34,000 members in advancing the quality, safety, and science of radiology and radiation oncology. The ACR conducts cutting-edge clinical and socioeconomic research, establishes quality and safety standards and provides continuing education and advocacy for radiologists, radiation oncologists and medical physicists. Since 1923, the ACR has worked to keep medical imaging and radiation oncology safe, effective and accessible for all. For more information or questions, please visit www.acr.org. (1-5) The American College of Radiology (ACR) initially solicited expert opinion from physician leaders with its Board of Chancellors. A working group was then formed to further identify common clinical scenarios in which imaging may be misused and should be reconsidered. Members of the group included the physician chairs or vice chairs of seven ACR commissions such as Quality and Safety, Appropriateness Criteria and Metrics. An initial list of topics was narrowed down based on the highest potential for improvement, representing a broad range of tests and the availability of strong guidelines. Members then researched specific recommendations and evidentiary statements based on their expertise. Recommendations that were too general or were well covered by other existing measures and initiatives were eliminated to identify the final five things list. 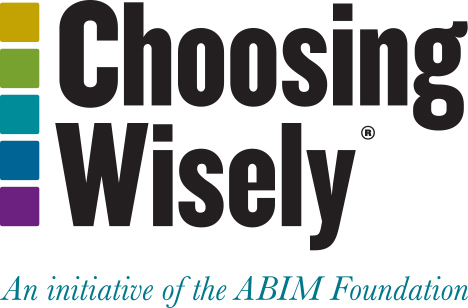 (6-10) The Choosing Wisely initiative was presented to the organization’s physician leaders at a Board of Chancellors meeting and a working group selected five initial low-value imaging targets for reduced utilization. The second set of targets was created by the following working group, with the goals of minimizing unnecessary imaging and biopsy generated by discovery of incidental findings, improving patient safety through reduced radiation exposure, and reducing unnecessary consultations based on imaging findings. Research: For the topics related to incidental findings on imaging exams, the American College of Radiology has created evidence-based white papers to provide guidance to practicing radiologists on making management recommendations. The white paper publications and additional relevant literature serve as the evidence supporting those recommendations. For the remaining recommendations pertaining to body CT protocol design, published literature was reviewed to define acceptable indications for multiphase protocols. ACR’s disclosure and conflict of interest policy can be found at www.acr.org. Institute for Clinical Systems Improvement (ICSI). Diagnosis and treatment of headache. Bloomington (MN): Institute for Clinical Systems Improvement (ICSI); 2011 Jan. 84 p.
Frishberg BM, Rosenberg JH, Matchar DB, et al. Evidence-Based Guidelines in the Primary Care Setting: Neuroimaging in Patients with Nonacute Headache. American Academy of Neurology. 2000. Available online: http://www.aan.com/professionals/practice/pdfs/gl0088.pdf (US Headache Consortium). Stephen D. Silberstein. Practice parameter: Evidence-based guidelines for migraine headache (an evidence-based review): Report of the Quality. Standards Subcommittee of the American Academy of Neurology. 2000;55;754 Neurology. (US Headache Consortium). Edlow JA, Panagos PD, Godwin SA, Thomas TL, Decker WW; American College of Emergency Physicians. Clinical policy: critical issues in the evaluation and management of adult patients presenting to the emergency department with acute headache. Ann Emerg Med. 2008 Oct;52(4):407-36. Torbicki A, Perrier A, Konstantinides S, et al. Guidelines on the diagnosis and management of acute pulmonary embolism: the Task Force for the Diagnosis and Management of Acute Pulmonary Embolism of the European Society of Cardiology (ESC). Eur Heart J. 2008;29(18):2276-315. Neff MJ. ACEP releases clinical policy on evaluation and management of pulmonary embolism. American Family Physician 2003;68(4):759–60. Stein PD, Woodard PK, Weg JG, Wakefield TW, Tapson VF, Sostman HD, Sos TA, Quinn DA, Leeper KV, Hull RD, Hales CA, Gottschalk A, Goodman LR, Fowler SE, Buckley JD. Diagnostic pathways in acute pulmonary embolism: recommendations of the PIOPED II Investigators. Radiology 2007;242(1):15–21. Gomez-Gil E, Trilla A, Corbella B, et al. Lack of clinical relevance of routine chest radiography in acute psychiatric admissions. Gen Hosp Psychiatry 2002; 24(2):110-113. Archer C, Levy AR, McGregor M. Value of routine preoperative chest x-rays: a meta-analysis. Can J Anaesth 1993;40(11):1022-1027. Munro J, Booth A, Nicholl J. Routine preoperative testing: a systematic review of the evidence. Health Technol Assess 1997;1(12):i-iv; 1-62. Grier DJ, Watson LF, Harnell GG, Wilde P. Are routine chest radiographs prior to angiography of any value? Clin Radiol 1993;48(2):131-33. American College of Radiology. ACR Appropriateness Criteria: routine chest radiographs in ICU patients http://www.acr.org/SecondaryMainMenuCategories/quality_safety/app_criteria/pdf/ExpertPanelonThoracicImaging/RoutineChestRadiographDoc7.aspx. Wan MJ, et al. Acute appendicitis in young children: cost-effectiveness of US versus CT in diagnosis-a Markov decision analytic model. Radiology 2009;250:378-86. Doria AS, et al. US or CT for diagnosis of appenditicis in children? A meta-analysis. Radiology 2006;241:83-94. Garcia K, et al. Suspected appendicitis in children: diagnostic importance of normal abdominopelvic CT findings with nonvisualized appendix. Radiology 2009;250:531-537. Krishnamoorthi R, et al. Effectiveness of a staged US and CT protocol for the diagnosis of pediatric appendicitis: reducing radiation exposure in the age of ALARA. Radiology 2011;259:231-239. Smith, MP, Katz, DS, Rosen, MP, Lalani, T, Carucci, LR, Cash, BD, Kim, DH, Piorkowski, RJ, Small, WC, Spottswood, SE, Tulchinsky, M, Yaghmai, V, Yee, J, Expert Panel on Gastrointestinal Imaging. ACR Appropriateness Criteria® Right Lower Quadrant Pain- Suspected Appendicitis. [Online Publication]. Reston (VA) American College of Radiology (ACR); 2013. Available at: https://acsearch.acr.org/docs/69357/Narrative/. Frush DP. Frush KS, Oldham KT. Imaging of acute appendicitis in children: EU versus U.S. or US versus CT? A North American perspective. Pediatr Radiolo. 2009;39(5):500-5. Levine D, Brown DL, Andreotti RF, Management of asymptomatic ovarian and other adnexal cysts imaged at US: Society of Radiologists in Ultrasound Consensus Conference Statement. Radiology 2010 256:943-54. Harris RD, Javitt MC, Glanc P, Brown DL, Dubinsky T, Harisinghani MG, Khati NJ, Kim YB, Mitchell DG, Pandharipande PV, Pannu HK, Podrasky AE, Royal HD, Shipp TD, Siegel CL, Simpson L, Wall DJ, Wong-You-Cheong JJ, Zelop CM; Expert Panel on Women’s Imaging. ACR Appropriateness Criteria® clinically suspected adnexal mass. [Online Publication]. Reston (VA) American College of Radiology (ACR); 2012. Available at: https://acsearch.acr.org/docs/69466/Narrative/. American College of Obstetricians and Gynecologists. ACOG Committee Opinion: number 280, December 2002. The role of the generalist obstetrician-gynecologist in the early detection of ovarian cancer. Obstet Gynecol 2002;100(6):1413–1416. American College of Obstetricians and Gynecologists. ACOG Practice Bulletin. Management of adnexal masses. Obstet Gynecol 2007;110(1):201–214. Timmerman D, Valentin L, Bourne TH, et al. Terms, definitions and measurements to describe the sonographic features of adnexal tumors: a consensus opinion from the International Ovarian Tumor Analysis (IOTA) Group. Ultrasound Obstet Gynecol 2000;16(5):500–505. Vaccarella S, Franceschi S, Bray F, Wild CP, Plummer M, Dal Maso L. Worldwide Thyroid-Cancer Epidemic? The Increasing Impact of Overdiagnosis. N Engl J Med. 2016 Aug 18;375(7):614-7. doi: 10.1056/NEJMp1604412. PubMed PMID: 27532827. Hoang JK, Langer JE, Middleton WD, Wu CC, Hammers LW, Cronan JJ, Tessler FN, Grant EG, Berland LL. Managing incidental thyroid nodules detected on imaging: white paper of the ACR Incidental Thyroid Findings Committee. J Am Coll Radiol. 2015 Feb;12(2):143-50. doi: 10.1016/j.jacr.2014.09.038. Epub 2014 Nov 1. PubMed PMID: 25456025. Ahmed S, Horton KM, Jeffrey RB Jr, Sheth S, Fishman EK. Incidental thyroid nodules on chest CT: Review of the literature and management suggestions. AJR Am J Roentgenol. 2010 Nov;195(5):1066-71. doi: 10.2214/AJR.10.4506. Review. PubMed PMID: 20966308. Wu CW, Dionigi G, Lee KW, Hsiao PJ, Paul Shin MC, Tsai KB, Chiang FY. Calcifications in thyroid nodules identified on preoperative computed tomography: patterns and clinical significance. Surgery. 2012 Mar;151(3):464-70. doi: 10.1016/j.surg.2011.07.032. Epub 2011 Sep 10. PubMed PMID: 21911238. Tanpitukpongse TP, Grady AT, Sosa JA, Eastwood JD, Choudhury KR, Hoang JK. Incidental thyroid nodules on CT or MRI: Discordance between what we report and what receives workup. AJR Am J Roentgenol. 2015 Dec;205(6):1281-1287. doi: 10.2214/AJR.15.14929. PubMed PMID: 26587935. Bahl M, Sosa JA, Eastwood JD, Hobbs HA, Nelson RC, Hoang JK. Using the 3-tiered system for categorizing workup of incidental thyroid nodules detected on CT, MRI, or PET/CT: how many cancers would be missed? Thyroid. 2014 Dec;24(12):1772-8. doi: 10.1089/thy.2014.0066. PubMed PMID: 25203387. Hobbs HA, Bahl M, Nelson RC, Kranz PG, Esclamado RM, Wnuk NM, Hoang JK. Journal Club: incidental thyroid nodules detected at imaging: can diagnostic workup be reduced by use of the Society of Radiologists in Ultrasound recommendations and the three-tiered system? AJR Am J Roentgenol. 2014 Jan;202(1):18-24. Nguyen XV, Choudhury KR, Eastwood JD, Lyman GH, Esclamado RM, Werner JD, Hoang JK. Incidental thyroid nodules on CT: evaluation of 2 risk-categorization methods for work-up of nodules. AJNR Am J Neuroradiol. 2013 Sep;34(9):1812-7. doi: 10.3174/ajnr.A3487. Epub 2013 Apr 4. Johnson PT, Mahesh M, Fishman EK. Image Wisely and Choosing Wisely: Importance of Adult Body CT Protocol Design for Patient Safety, Exam Quality, and Diagnostic Efficacy. J Am Coll Radiol. 2015 Nov;12(11):1185-90. doi: 10.1016/j.jacr.2015.02.021. Epub 2015 Apr 16. Review. PubMed PMID: 25892227. Strother MK, Robert EC, Cobb JG, Pruthi S, Feurer ID. Reduction in the number and associated costs of unindicated dual-phase head CT examinations after a quality improvement initiative. AJR Am J Roentgenol. 2013 Nov;201(5):1049-56. doi: 10.2214/AJR.12.10393. PubMed PMID: 24147476. Guite KM, Hinshaw JL, Ranallo FN, Lindstrom MJ, Lee FT Jr. Ionizing radiation in abdominal CT: unindicated multiphase scans are an important source of medically unnecessary exposure. J Am Coll Radiol. 2011 Nov;8(11):756-61. doi: 10.1016/j.jacr.2011.05.011. PubMed PMID: 22051457; PubMed Central PMCID: PMC4131253. Fulwadhva UP, Wortman JR, Sodickson AD. Use of dual-energy CT and iodine maps in evaluation of bowel disease. Radiographics. 2016 Mar-Apr; 36(2):393-406. doi: 10.1148/rg.2016150151. PubMed PMID: 26963452. Artigas JM, Martí M, Soto JA, Esteban H, Pinilla I, Guillén E. Multidetector CT angiography for acute gastrointestinal bleeding: technique and findings. Radiographics. 2013 Sep-Oct; 33(5):1453-1470. doi: 10.1148/rg.335125072. Review. PubMed PMID: 24025935. Geffroy Y, Rodallec MH, Boulay-Coletta I, Jullès MC, Ridereau-Zins C, Zins M. Multidetector CT angiography in acute gastrointestinal bleeding: why, when, and how. Radiographics. 2011 May-Jun; 31(3):E35-46. Review. Erratum in: Radiographics. 2011 Sep-Oct;31(5):1496. Radiographics. 2011 Nov-Dec;31(7):2114. Fullès, Marie-Christine [corrected to Jullès, Marie-Christine]. PubMed PMID: 21721196. Chan MG, Cassidy FH, Andre MP, Chu P, Aganovic L. Delayed imaging in routine CT examinations of the abdomen and pelvis: is it worth the additional cost of radiation and time? AJR Am J Roentgenol. 2014 Feb;202(2):329-35. doi: 10.2214/AJR.12.10468. PubMed PMID: 24450673. Rodolfino E, Devicienti E, Miccò M, Del Ciello A, Di Giovanni SE, Giuliani M, Conte C, Gui B, Valentini AL, Bonomo L. Diagnostic accuracy of MDCT in the evaluation of patients with peritoneal carcinomatosis from ovarian cancer: is delayed enhanced phase really effective? Eur Rev Med Pharmacol Sci. 2016 Nov;20(21):4426-4434. PubMed PMID: 27874958. Monzawa S, Ichikawa T, Nakajima H, Kitanaka Y, Omata K, Araki T. Dynamic CT for detecting small hepatocellular carcinoma: usefulness of delayed phase imaging. AJR Am J Roentgenol. 2007 Jan;188(1):147-53. PubMed PMID: 17179357. Iannaccone R, Laghi A, Catalano C, Rossi P, Mangiapane F, Murakami T, Hori M, Piacentini F, Nofroni I, Passariello R. Hepatocellular carcinoma: role of unenhanced and delayed phase multi-detector row helical CT in patients with cirrhosis. Radiology. 2005 Feb;234(2):460-7. PubMed PMID: 15671002. Lim JH, Choi D, Kim SH, Lee SJ, Lee WJ, Lim HK, Kim S. Detection of hepatocellular carcinoma: value of adding delayed phase imaging to dual-phase helical CT. AJR Am J Roentgenol. 2002 Jul;179(1):67-73. PubMed PMID: 12076907. Keogan MT, Seabourn JT, Paulson EK, McDermott VG, Delong DM, Nelson RC. Contrast-enhanced CT of intrahepatic and hilar cholangiocarcinoma: delay time for optimal imaging. AJR Am J Roentgenol 1997;169:1493-9. Loyer EM, Chin H, DuBrow RA, David CL, Eftekhari F, Charnsangavej C. Hepatocellular carcinoma and intrahepatic peripheral cholangiocarcinoma: enhancement patterns with quadruple phase helical CT a comparative study. Radiology 1999;212:866-75. Coakley FV, Varghese SL, Hricak H. CT and MRI of pelvic varices in women. J Comput Assist Tomogr. 1999 May-Jun;23(3):429-34. PubMed PMID: 10348450. Rozenblit AM, Ricci ZJ, Tuvia J, Amis ES Jr. Incompetent and dilated ovarian veins: a common CT finding in asymptomatic parous women. AJR Am J Roentgenol. 2001 Jan;176(1):119-22. PubMed PMID: 11133549. Hiromura T, Nishioka T, Nishioka S, Ikeda H, Tomita K. Reflux in the left ovarian vein: analysis of MDCT findings in asymptomatic women. AJR Am J Roentgenol. 2004 Nov;183(5):1411-5. PubMed PMID: 15505313. Khosa F, Krinsky G, Macari M, Yucel EK, Berland LL. Managing incidental findings on abdominal and pelvic CT and MRI, Part 2: white paper of the ACR Incidental Findings Committee II on vascular findings. J Am Coll Radiol. 2013 Oct;10(10):789-94. doi: 10.1016/j.jacr.2013.05.021. PubMed PMID: 24091049. Warshauer DM, Lee JK. Adult intussusception detected at CT or MR imaging: clinical-imaging correlation. Radiology. 1999 Sep;212(3):853-60. PubMed PMID: 10478257. Rea JD, Lockhart ME, Yarbrough DE, Leeth RR, Bledsoe SE, Clements RH. Approach to management of intussusception in adults: a new paradigm in the computed tomography era. Am Surg. 2007 Nov;73(11):1098-105. PubMed PMID: 18092641. Olasky J, Moazzez A, Barrera K, Clarke T, Shriki J, Sohn HJ, Katkhouda N, Mason RJ. In the era of routine use of CT scan for acute abdominal pain, should all adults with small bowel intussusception undergo surgery? Am Surg. 2009 Oct;75(10):958-61. PubMed PMID: 19886144.